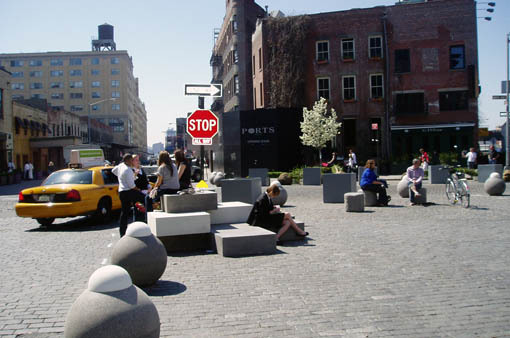 Gansevoort Plaza was a wide open cobblestone intersection in the heart of the Meatpacking District. 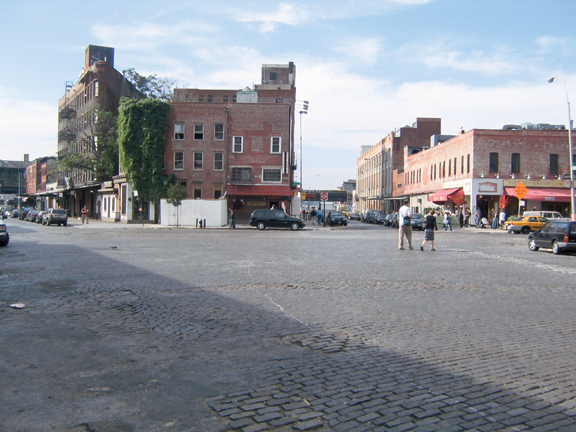 Manhattan's newest historic district, the Meatpacking District, is known for unique wide streets lined with distinctive Belgium pavers, and low rise buildings. Still a working district, recent changes in land use have brought in major fashion houses and boutiques, cutting-edge restaurants, nightlife, and hotels. The district's problems today are principally a result of its success, and the tremendous growth and development it has seen since the mid 1990's. Traffic, congestion, declining pedestrian safety, noise, and worsening neighborly relations are all burgeoning problems recognized by residents and local leaders as threats to the area. PPS worked with business owners, residents, and community leaders to define the problems, identify best practices, and formulate a vision for what they want their neighborhood to be. PPS held a community workshop and conducted observations -- which included traffic counts, pedestrian counts, activity mapping, time lapse video, parking analysis and surveys -- and used the findings to create a community-based vision for the district's future. PPS found that an over-supply of taxis, wide streets and confusing traffic patterns resulted in unnecessary late-night congestion, as well as dangerous pedestrian-vehicular conflicts. Recommendations for improving these conditions include narrowing some streets, creating dedicated loading zones, and creating drop-off and pick-up areas. Recommendations for improving these conditions include narrowing 9th avenue, adding public and cafe seating areas, creating dedicated loading zones, and creating drop-off and pick-up areas. PPS developed a photosimulation of the vision for a plaza that has seating, planters and the flexibility to host temporary events. As a result of this study and visioning process, community leaders created the Greater Gansevoort Urban Improvement Project (GGUIP). GGUIP has hired the Regional Plan Association and Sam Schwartz Company to model traffic impacts and the feasibility of the community's vision. GGUIP expanded the study zone, to ensure that they can make the most positive impact on traffic in as large an area as possible. 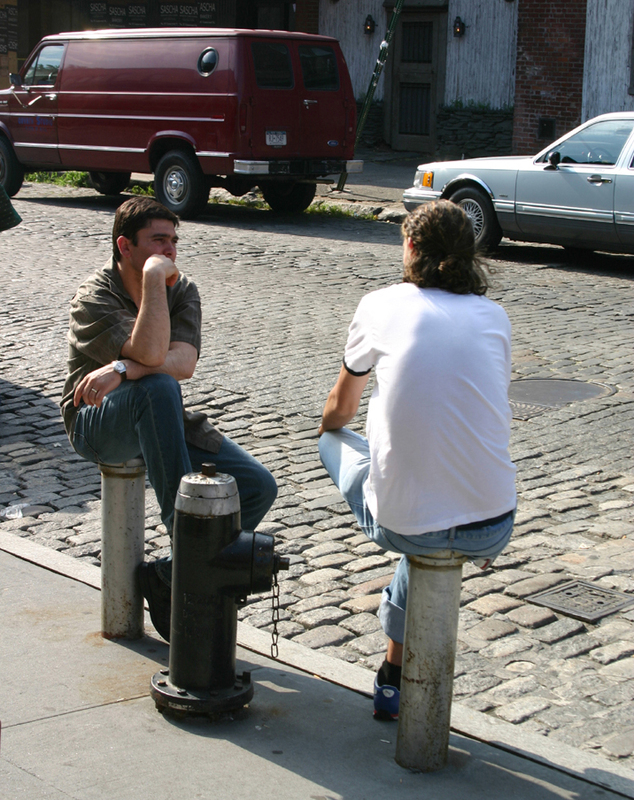 The project was implemented in spring 2008 with a radical reclamation of public space protected by planters, concrete balls, and sitable artforms. The number of people sitting, socializing and spending time in the district has increased significantly. There have been some issues with traffic flow and drop off space that may need to be addressed. The design will continue to be adapted to best respond to community needs. PPS' project partners included MPDI, Transportation Alternatives, Community Board 2 Transportation Committee, and several elected officials. This project was part of theNYC Streets Renaissance Campaign, a movement to re-imagine the streets of New York City as lively public places. There were no pedestrian amenities in the area, and no places to sit. 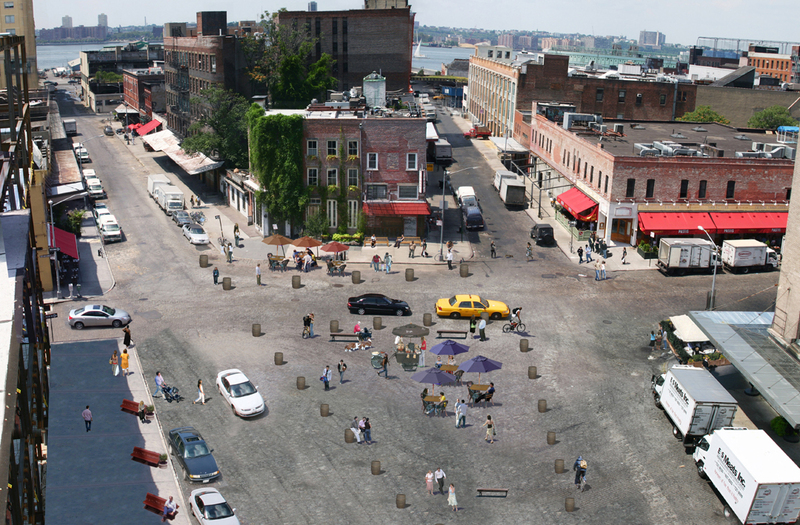 The community vision for Gansevoort Plaza was depicted in a photosimulation.